Originally published under the title "The Curious Cases of Anti-Muslim Backlash That Turned Out To Be False." 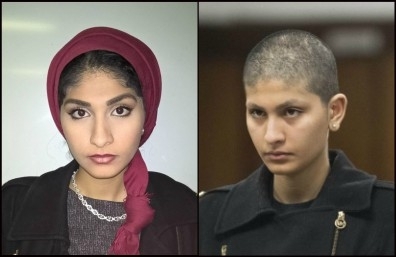 Yasmin Seweid falsely claimed to have been attacked on the subway by Trump supporters to avoid punishment for missing curfew by her strict Egyptian father, who subsequently forced her to shave her head. Americans are constantly warned by mainstream media that our prejudices and intolerance "radicalize" Muslims. A new study in the journal Personality and Social Science Bulletin finds that the more Muslims feel "dehumanized" by American society, the more inclined they are to support violence and the less inclined they are to assist law enforcement in fighting terrorism. "If we use rhetoric and enact policies that make Muslims feel dehumanized, this may lead them to support exactly the types of aggression" that we hope to discourage, says the study's coauthor. This powder-keg narrative is so ingrained that it recurs almost reflexively after every terror attack. And yet the much-predicted anti-Muslim backlash never materializes, in spite of a veritable industry promoting the idea. In point of fact, American society is incredibly tolerant of Muslims and even Islamists. FBI statistics still show that most anti-religious hate crimes in the US are perpetrated against Jews. Even in the days following the election of Donald Trump, when the media was ablaze with talk of anti-Muslim backlash, Muslims constituted just 6 percent of "hate crimes" documented by the Southern Poverty Law Center (SPLC), one of the loudest voices warning of so-called "Islamophobia" in recent years. American society is incredibly tolerant of Muslims and even Islamists. What has been occurring with increasing regularity, though, is the appearance of a backlash against Muslims perpetrated by Muslims themselves. Take the case of the University of Michigan student who in November 2016, shortly after the presidential election, told police that two male Trump supporters attacked her and threatened to set her on fire if she failed to remove her hijab. Police say the report was false and that the as-yet unnamed woman may face charges. Or the Louisiana woman who claimed to be the victim of an anti-Muslim attack in Lafayette the day after the election. Two men, she claimed, one of them wearing a Trump hat, stole her wallet and demanded she remove her hijab. Lafayette police have deemed it a hoax but have not released the woman's name. Or Yasmin Seweid, the New York City college student who lied about being harassed (again, her hijab snatched from her, she claimed) by Trump supporters on the Number 6 train on December 1, 2016. Or Michael Kee, the reportedly Muslim Beloit College (Wisconsin) student who spray-painted anti-Islamic graffiti on the door of his own dormitory room on January 30 and then reported it as a hate crime. What can explain the rise of fake anti-Muslim crimes? Ibrahim Hooper of the Hamas-linked Council on American Islamic Relations (CAIR) explains that Muslims in America are "under great psychological stress and tension right now, and that in itself can cause mental health issues that lead to these types of incidents." CAIR uncritically disseminated Yasmin Seweid's lie but failed to set the record straight when it was exposed. It issued a press release condemning the "attack" on Seweid but has yet to issue a retraction. Its website still links to three stories reporting the incident, but not a single follow-up story documenting Seweid's arrest for fabricating the story. Hate crime hoaxes empower Islamic extremists who tell Muslims to beware American prejudices. CAIR has also taken to describing nearly any crime against any Muslim (especially on college campuses) as a hate crime, such as its advocacy on behalf of Nasro Hassan, the University of Washington student who claims to have been hit in the face with a bottle on the campus. Hassan wears a hijab, and while she claims her attacker uttered no words and was seen by neither witness nor victim, she and CAIR insist, without providing any evidence, that she was attacked because she is a Muslim. While it is unlikely that CAIR (and other groups, like the Muslim Public Affairs Council) are actually coordinating the rise of anti-Muslim hoaxes, they are certainly feeding the phenomenon, perhaps inspiring new cases with their histrionic reporting. Every minute law enforcement officials spend investigating fraudulent "hate crimes" is time not spent investigating real crimes. But perhaps even more dangerous is the credence these hoaxes give to CAIR and other extremist groups who preach that Muslims must beware of anti-Muslim prejudice in America, facilitating their "radicalization."